FOFOA: Relativity: What is Physical Gold REALLY Worth? What is a piece of physical gold in the hand (of a banker) really worth today? As sentient beings, we humans exist in a certain, specific frame of reference. For example, a small golden sun disc appears to circle our giant green planet each day. This is our frame of reference. But in another frame of reference, say, sitting in a space ship in outer space, the sun would appear stationary and the Earth would be seen spinning. And in yet another frame of reference, an astronomical time and scale frame, the Earth would be seen circling the sun while they both circle the galaxy together. The point is that it is not difficult to picture other frames of reference in your mind once you learn how, but getting to that point of ease requires either centuries of thought or a little help. One of the unique characteristics of gold that sets it apart from commodities is that its primary use - store of value - has no weight or mass requirements. In commodities, where industry is the primary user, weight is critical. If you are a builder who needs a ton of copper, then your need for this specific weight is more important than, and independent from, the price of copper. If copper rises in price, then darn-it, you must pay more. If copper falls in price, hurray, you just saved yourself some money. But if your need is to store $100,000 worth of present value in gold, it doesn’t matter how much gold you get. All that matters is that whatever weight you get reliably and efficiently stores your value. One ounce could do just as good of a job as 100 ounces. In fact, one ounce would do a BETTER job than 100 ounces! The less gold it takes to store your value, the better it does its job. This particular “gold dynamic” sets it apart from all commodities. One ounce would store your value more efficiently and stably than 100 ounces because A) your storage and security costs would be lower (efficiency), and B) if one ounce is worth $100,000 then that infers gold is being valued by many more people relative to when it was $1,000 per ounce. This wider distribution brings with it a more stable base of valuation and less relative volatility in price (stability). Comparing this “gold dynamic” to any industrial or food commodity we can see a stark difference. What commodity could perform its job BETTER at a price 100x higher than today? Can you name one? Almost the entire human race today shares a common frame of reference when it comes to physical gold investing. That frame of reference is that when you invest in gold (you store value in gold) you are doing so in a specific weight of gold. “I bought ten ounces today,” you might say. Notice that you didn’t say, “I transferred $12,000 of value into gold today,” or, “I exchanged $12,000 for gold today.” It is true that you might have mentioned the price, but you ALWAYS mention the weight. Even if it’s just to yourself. Of course there is nothing wrong with this perspective, this frame of reference, as long as you actually did take possession of the gold. But what if you didn’t take possession? Notice the subtle difference in ETF investing, like GLD. If you bought some GLD today you might say, “I bought $12,000 in GLD shares today,” or, “I put $12,000 into GLD today.” Can you see the difference? Feel free to substitute anything besides actual physical in for GLD. The next question is, Are there some gold investment vehicles in the world today that are less clearly either paper (GLD) or physical (e.g. Coins) in which the common frame of reference is denominated in weight? In other words, is there a way you could say, “I bought ten ounces today” and mean it, without ever touching the gold? Of course! There are many. Are they all equal? Of course not. Is there an ounce of gold somewhere out there in the world set aside for everyone that thinks they own one? Unfortunately there is not. So what we end up with today is a wide spectrum of “gold investment” options of relatively different qualitative values. On one end of the spectrum we have physical gold coins stuffed in the “gold toe” of your black socks in the back of your sock drawer. ;) And on the other end we have investments like GLD from which you cannot take delivery, and in fact, you are quite unclear on the legal definition of its “physical backing” and who actually owns that “physical” gold. And in between these two there are many other options where your investment is actually someone else’s liability to you. Sometimes it is a weight-denominated liability. 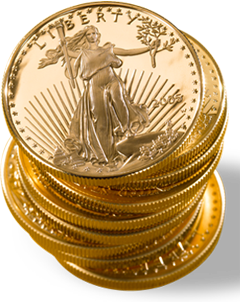 Sometimes it is a dollar-denominated liability fixed at par to the published trading price of gold. Sometimes it is a weight-denominated liability with the contractual option to settle in currency at the published price of that weight of gold left to the depository’s discretion. And other times it is strictly weight-denominated because the depository knows full well that, in a pinch, the legal system can and does only enforce currency settlements. Think about this last one for a minute. Imagine you paid in advance for a new tractor from a tractor company. But before it finished building your tractor, the factory went out of business. When you later sue the factory owners in court, do you think the judge will award you a tractor? Can a judge force a defunct company to cough up a tractor it doesn’t have? Of course not. This is why the legal system can and does only enforce legal tender settlements. Hopefully it is clear now that this wide spectrum of “gold investment” options casts a rather hazy cloud over the aggregate amount of “wealth” stored in gold from a weight-based frame of reference. 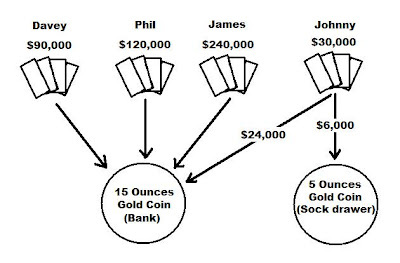 If Johnny were to sell the banker one of his “sock drawer coins” (deposit in an unallocated bank account) for $1,200, the banker would put it in his vault, give Johnny a claim check for that ounce, and then sell 25 more “one ounce” claim checks to Davey, Phil and James. Can you see how this works? I apologize for making this point embarrassingly simple, but hopefully this will enhance the likelihood that all of you will get it. If necessary, please give this simple shift in your frame of reference some time to sink in before you read on. Look to LBMA, for currency looking for gold! Compare the Comex average open interest with its average daily trading volume. Now use average daily trading volume at LBMA and convert to open interest in London, using comex ratio. Here you will find "real currency" in "paid for" gold derivatives ( not futures ) ! This money is now looking to convert to physical! It is caught in this paper with no way out! It is true, that in times past when a currency is inflated (over printed) to a point of only 10% real gold backing, the government could revalue gold upward and the currency was 100% backed again! A terrible blow to the holders of this paper, but at least the money system survived! Today, the world's currency, the US$, by default, would require a gold price of many, many thousands to back it without using its citizens as collateral! The only problem with this is the US gold stock is so small, that even at $10,000/oz, a large deflation would be necessary to decrease the outstanding US currency to this gold backing level! The BIS is the gold broker for all interbank sales/purchases. Bullion Banks are for sales to other entities. Sir, The history of "Hot" paper money does show it to "burn easily" from " much heat"! If you read my Thoughts in today's replies, we see much "fuel" in dollar derivatives trading in foreign markets. Much of this trading represents a "claim" on physical gold that may become "a transaction for physical gold" as dollar reserves are displaced. The $6,000 valuation of gold can only be true if currency deflation destroys enough dollars to bring it down to that range. Without deflation, the dollar will be devalued much lower than this (higher gold price)! I will note that gold was around $300 per ounce at the time the above was written. Has the paper gold market leveraged up or down since 1998? “Three big banks – HSBC, Société Générale and BNP Paribas – were among more than 10 based in Europe that swapped gold with the Bank for International Settlements in a series of unusual deals that caused confusion in the gold market and left traders scratching their heads. “Jaime Caruana, head of the BIS, told the FT the swaps were “regular commercial activities” for the bank. “In a short note in its annual report, published at the end of June, the BIS said it had taken 346 tonnes of gold in exchange for foreign currency in “swap operations” in the financial year to March 31. “…In a gold swap, one counterparty, in this case a bank, sells its gold to the other, in this case the BIS, with an agreement to buy it back at a later date. “The gold swaps were, in effect, a form of collateral… Gold is widely regarded as one of the safest assets, but has not been widely used as collateral in the past. Mr Caruana described the transactions as “loans with a guarantee”. “Investors have bought physical gold in record amounts during the past two years and deposited it in commercial banks. European financial institutions are awash with bullion and some are trying to pledge gold as a guarantee. “George Milling-Stanley, managing director for government affairs at the industry-backed World Gold Council, said: “The gold swaps commercial banks carried out with the BIS demonstrate the effectiveness of gold as an asset class, because even in the depths of the worst liquidity crisis in living memory, institutions with access to gold were able to make use of it to generate dollar liquidity. “Last year, CME Group, the world’s largest derivatives exchange, allowed investors to use gold futures as collateral for some operations. Other institutions, such as central banks, had begun using and requesting gold as collateral in the past two years as perceptions of counterparty risk have risen, bankers and officials said. “The gold used in the swaps came mainly from investors’ deposit accounts at the European commercial banks. Some investors prefer to deposit their gold in so-called “allocated accounts”, which restrict the custodian banks’ ability to use the gold in their market operations by assigning them specific bullion bars. But other investors prefer cheaper “unallocated accounts”, which give banks access to their bullion for their day-to-day operations. The dollar/gold bid dynamic is a relativistic Thought experiment, not unlike Einstein’s Special Relativity. It can be viewed differently from many reference frames. Dollars bidding for paper gold. Paper gold bidding for dollars. Dollars bidding for physical gold. Physical gold bidding for dollars. Smart dollars bidding for physical gold. Paper gold bidding for “idiot dollars”? And with this, I leave you to finish the puzzle on your own. Hopefully a new frame of reference helps. Please see my comments below for additional clues to the puzzle. Let's look forward to when the elephant in the room manifests as Ganesh, Lord of Beginnings and Remover of Obstacles. 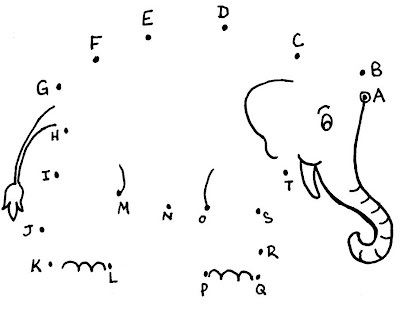 @costata, from last page of comments. I already have FRNs safely stored away as well as gold. In more than one location. I am armed and prepared to defend what I have from burglars or Future Fascist Thugs. The idea behind as many people as we can get to pulling $500 out of the ATMs on Thurs., Aug. 12 is to send a signal. A few hundred (more) or even a few thousand more people pulling money out of the banks will not bring any of them down. It would be a blip, but a NOTICEABLE blip, that a vanguard is prepared to act in protest of TPTB. It would get picked up by the banks' computers and might even make Friday the 13th a more fun day in the markets. 1. When this massive revaluation occurs, will it be overnight so you wake up one day and we're all wealthy? 2. People often refer to gold being worth as much as a mans suit ... and that's all it will ever be valued at. Is there a "quick" answer that I can reply with when people make this reference? Remember it is said that in Ancient Rome - 1oz of Gold bought you a top toga, hand made belt and hand made sandals and a perhaps a hat. So it is more accurate to get a proper tailor to measure you up, cut your size out, choose a really nice cloth, throw in a really nice shirt and tie. Then get a man to hand make a belt for you and get your own pair of shoes made by a cobbler and a hat made by hand. Clearly you would be set back many thousands of dollars.....some say $15,000. The ounce of Gold in ancient Rome referred to the best cloth in togas at the time. The point i'm making is 1 ounce of Gold is massively undervalued in dollar terms in 2010. I hear you. If I was in your country I would probably join in just for the symbolism and to express support for the sentiments that DoChen, VI etc have expressed. I'll buy a bumper sticker too if you can come up with a universal slogan. First rate for clarity of thought and expression. Bravo! Anyone watch the World Cup? After watching England dumped out early, I despair of ever seeing them lift that trophy again. That trophy, the beautiful Jules Rimet Trophy, is 5kg of 18 carat gold, or 3.75kg of pure gold. At todays "price", the gold in that trophy is worth about $142,000. Now our neighbours have just sold their house (small, 3 bedroom, inner city, Sydney Australia) for 6.5 Jules Rimet Trophys. Thats all I need to know. Something has gone horribly horribly wrong with the "price" of gold. Or possibly with the price of houses in Sydney. Or most probably both. I fully expect in the not too distant future that sanity will prevail, at which point one Jules Rimet Trophy will buy me 6.5 small 3 bedroom inner city houses in Sydney Australia. Should I need them. i know ...i know these cheap prices give us the bargain of the century. but i'd really like to see some value FIREWORKS! ala massive 50times instant increase in the price of GOLD!! lol! It is frustrating isn't it. It's the not knowing that gets to me. Not knowing when, and in dark moments if, a tipping point will come. I've being buying bullion for not so long. The first time was maybe only 4 months ago. First few times I was the only person there. Next couple of times, a few more faces. Last two times, there has been a queue at the door. Short queue, but definitely a queue. Great summation of the US situation (if a little oversimplified). Well.. I see the point in terms of value, but it poses a few questions. Does Freegold still allow 20:1 paper on physical? Why if physical is worth so much more to a bank is there any outside the banking system at all? lol....have a look at Scopelabs on youtube.....lol.....everything ok? I've being buying bullion for not so long. The first time was maybe only 4 months ago. Did you see the dates on the quotes from ANOTHER? Some people bought gold back then. That's over a decade(!) ago. They've done well, but no real fireworks yet. Apart from the above, buying gold to me means buying wealth. I look at the price of gold daily out of interest, but I don't really care about it. I know my gold beats paper, and I will not sell it for the foreseable future. To me, owning some real wealth is more secure than any paper, and calculating the paper price daily does not really add anything to that. By the time I will have to call upon my gold, the world will most likely have changed, and I do not believe today's paper values to readily reflect those future changes, hence they matter relatively little to me. I'm not buying gold to drive a race track, but rather for security. @paul, I think people like you and me who have started collecting physical some months ago(It seems that I started exactly with you) should pray that this re-evaluation does not happen so quick. I am praying for some another 10 - 15 years ? though I feel that it may eventually happen a lot that. I acquire physical in the hope of deploying it after the complete collapse of the global financial system. Trying to start a business now is suicide because the bankers and politicians have virtually given themselves all the right to rip us off in broad daylight and I do not want to use my gold in such a uncertain world stage. "Trying to start a business now is suicide because...."
That is the core of the problem with the present failing system. Small business is the engine of employment, not big business. Government employment is an oxymoron in terms of productivity. I will happily start a business again once I can deploy capital (savings) usefully plus my labour in a "market" that isn't rigged. All of Another's and FOA's posts are before the GLD ETF. What affect do you think the GLD ETF is having on the gold market? How is it operating? Is it helping to drive up the cost of gold by storing physical gold that can't be fractionally resold or is it having the opposite affect? For those waiting for fireworks... Aren't we in fact expecting a collapse in the COMEX price as people flee from paper? ANOTHER repeatedly states that gold will "go into hiding", i.e. we won't know it's worth for a time! During that period, gold's value will be unknown! So, don't pay too much attention to the daily spot. As you can, convert US legal tender into gold, and wait. I for one do not relish a coming revaluation. As much as I would prefer a meritocracy and honest economy, I would rather have more time to accumulate (as I have been since $750). Imagine all that is implied by a revaluation...socially, politically, economically. It won't be orderly. When the spot price takes a hit, I happily buy. Most likely the GLD ETF has the effect of adding more paper to the market. I doubt that GLD really has the gold they claim to have acquired. Even if they did, all YOU have is a paper claim on gold. So, when people run to the banks for their cash, a GLD owner may run to the bank for their gold. Both face the same consequence, shut doors, rationing of cash/gold, outright default. for the comex to show signs of failing as a paper exchange you would have to start seeing OI drop (which is happening, it has fallen 80k contracts in July) and the faster they create position limits the better. it would also help if those traders would stand for delivery and take the comex credits away but they are not interested in gold, just the currency. maybe some know that there is no gold and they trade it like any other instrument but are long physical gold. i think FOFOA said that if the paper gold price continues to rise then that would mean continued support for the current system. Can someone please explain what is an OI ? I keep reading that in harveys blog too. Another brilliant post as usual. I have learned so much from your posts that I'm actually able to think of a question! For the purposes of framing my question I'd like to consider an extreme circumstance. Let's imagine for a moment that folks buying gold on the LBMA aren't interested in the gold. Let's image that all of the paper market participants realize that the LBMA is nothing more than a speculators pit and these folks are simply interested in flipping paper gold to make a quick buck. Let's further imagine as a result -- when the LBMA defaults on claims against its unallocated accounts, market participants are very happy to take the cash along with the shut-up money (additional payment in cash above the spot price) and plan to use those proceeds to buy land, cars, and statues for their front lawns. If such a thing were to happen, would not the price of gold stay the same? What if 50% of paper gold speculators were interested in FIAT gains alone? 25%? 10%? Does this not change the outcome of sky-high revaluation for physical gold? Thank you again for your incredible insight. @Jenn, if that was the case, that the players were only interested in paper profits, then who else would know better than the CB/LBMA and the COMEX gang ? Thus if this was a reality then there was absolutely no reason for all these parties involved(CBs/LBMA/COMEX) to suppress the price of gold, right ? Let the paper speculators revel in the paper profits of a soaring price why suppress it from all direction ? You scratch my back and I scratch yours! Thanks for the reply dojufitz. Does anyone have the answer to my first question? No one knows the answer to that. ANOTHER said we'd be stunned as gold "sliced through $10,000". But what does that mean? One possible scenario entails a central bank openly bidding at a revalued price. All markets on Earth would immediately follow suit. That would not take more than a few hours, in my opinion. Since Freegold entails a systemic collapse, it is likely to occur suddenly. Do not hesitate to distinguish between the various players at the LMBA/COMEX. The CBs did have an interest in driving down the price of gold. That does not however not imply that all other participants share those goals. Perhaps the CBs set up a paper casino in order to suppress the POG, and other participant were happy to play. I thin Jenn makes a reasonable assumption stating that most of the paper players are interested in price gains only. 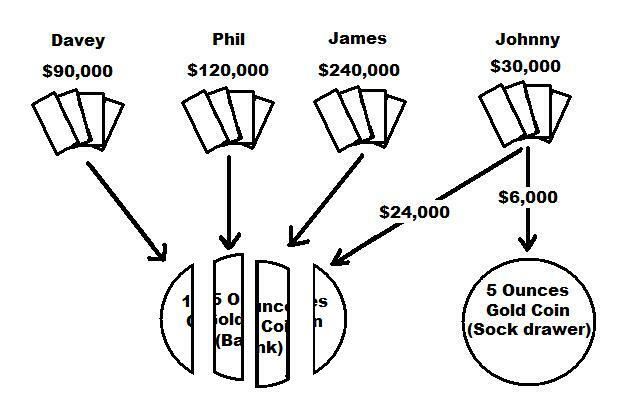 If they are, they will not be determining golds value (nor value it very high), but a the mere existence of a some of casino players does mean other people won't value gold. CBs still do, and many other persons of value most likely do as well. And when they will set gold to a new value they have little reason to mind the COMEX players. Apart from that, the bullion banks themselves (being major players and COMEX casino dealers) most likely understand the game quite well and will not loose. He did say did. He also was ambivalent about how the COMEX would end (either in an upward 'short squeeze style- explosion or a massive implosion), although A did seem to believe paper would implode. However, they have never elaborated on the COMEX that much, other than depicting it a paper game. That prospect did alarm creditors in the 1980s when the real yields on government debt shot up. But it does not seem to now. America and Britain are paying only 3-3.5% to borrow for ten years. That may be because deflation seems the more immediate threat. It may be because bond markets are now dominated by other central banks, which are more interested in managing exchange rates than in raising returns. But it is not stable to combine low yields, high deficits and governments that are happy to see their currencies depreciate. Something has to give. Russell response -- That last sentence, "Something has to give." sticks in my mind. What is it that might give? Could it be the price of gold? Gold could rocket higher when it is widely accepted that it is the only real and trustworthy money, money that needs no counter-party and that gold is the only money that has no counter-party. Gold is wealth on its own. Every nation in the world can collapse and gold will still represent unquestioned and eternal wealth. It seems as though he is speaking of FreeGold. I think you are viewing this formula upside down. It is the total amount of currency riding in gold (on average - at all times) on the price discovery markets divided by the "window dressing" gold stocks that are actually available for delivery demands against that currency, times the published "trading price of gold" that creates the true value of physical gold in currency terms. The difference between the true value and the published trading price can be viewed as a measure of public blindness to the real value of fractional reserve banking to the banker. The private thoughts, intentions and beliefs of the people behind the currency that is riding in gold investments for whatever reason does not affect the true value of the actual gold reserves behind those claims. Obviously those people don't understand what's going on or they wouldn't be in paper gold. Yet their misunderstanding of the situation adds more hidden value to the underlying reserves as well as to the coins in your sock drawer. The more currency that piles into paper gold and unallocated gold deposits the more valuable your coins become! The public shock when this true value is shown for all to see will only happen once. But once will be enough for your time of life, as Another said. So when will it be shown? Another said, "physical gold is of much greater value than public traders can move it for"! In your world, this cannot be, but it is, and will show for all to see in your time." He said, "The BIS is the gold broker for all interbank sales/purchases." And, "is going to force those claims into real bids instead of just claims!" What did we learn from that video above that all bankers fear most? That's right, a run on the banks. And in gold, that means the withdrawal of physical at its "published trading price" rather than its true value. Most of the analyses I read from other writers about the BIS gold swap assume one of two things, sometimes both. One, they assume that this "swap" is somehow being used to knock down the price of gold or to expand the CB manipulation of the gold price. Or to flood the markets with more physical. Or to extend the current system in some way. Two, they assume the BIS wants to "take in more gold," or to further centralize the ownership of gold. To accumulate more gold in the banking system. And on the former, this swap, initiated by the BIS, actually removed some of the "window dressing" from the "unallocated account window" of certain European banks, even if only temporarily. And it is the temporary nature of this swap that makes me think Freegold may be close at hand. Look at my illustrations above. If Davey started a panic and ran to the bank to take out his gold, he could take out the full 15 ounces since he had 75 "one ounce claim checks". That would kill the banking system and leave Phil and James with no gold. But what if when Davey panicked he found out the bank had swapped its 15 ounces for currency from the BIS? What would happen then? Davey would be given back his $90,000 in currency, Phil would get his $120,000, James would get back his $240,000 and Johnny would get his $24,000. The true value of the 15 gold coins would be exposed and that returned currency would now become "real bids instead of just claims!" Again, "The BIS is the gold broker for all interbank sales/purchases." And, "is going to force those claims into real bids instead of just claims!" Davey could now buy 2.8 ounces with his real bid of $90,000. Phil could buy 3.8 ounces. James could buy 7.6 ounces. And Johnny could buy three quarters of an ounce in addition to the 5 ounces still in his sock drawer. Everyone gets their rightful amount of gold. And only Johnny's secret sock drawer explodes in relative value. What might we expect to see right before this happens? Contracting OI in the paper gold futures market? Declining GLD shares outstanding? Quiet liquidations in paper gold? Declining (but not crashing) paper price of gold? The "BIGGEST gold swap in history"? Perhaps the FIRST EVER gold swap between the BIS and private banks engaged in unallocated gold accounts... initiated by the BIS? What else? If you do not like what is happening in your country, please join in! Tell your friends. Yank what you can on Aug 12 from the machines. Someone there at ZH said the fastest was to spread the word is via Twitter (whatever that is). Since few know the real number of claims against the real quantity of gold, few know the true value of gold. The paper traders are conjuring up a price which is in effect the consensus view of what gold is worth. They are not trading the price of gold, they are trading the idea of the price of gold. Thats why you hear so many howls of "gold is topping", "gold must fall". The "high" price clashes with peoples' idea price. Better ideas (pictures of reality) always triumph in the end. In the meantime enjoy the spectacle, played out as price volatility amongst other things, as these two ideas battle to the death. anecdotally I've just seen my first SPDR GLD banner ad. Just me or is this a new ad campaign? Looks like they're hunting for fresh idiot dollars. It is a common assumption among analysts that the FT article about the BIS gold swaps was at least fact checked with Jaime Caruana, General Manager of the BIS, if not outright spoon fed. That it represents as close an approximation to an official BIS press release as we are going to get. I note that it took more than three weeks from the first articles about the gold swaps appearing online until the FT piece emerged. I tend to believe this assumption. I also believe that the BIS did not intend for the gold swaps to make the news in the way they did. But once they did make the news, the BIS had to carefully decide what information to release about it to put much of the speculation to rest. This took about three weeks. They would want to release only information that would not come back to bite them later. They could also say certain things that were not completely truthful as long as those statements described "intent", something that could not be proved false by the evidence. For example, that the "intent" of the swap was "to obtain a return on its huge US dollar-denominated holdings." Obviously, if the BIS is now earning a return on those dollars, this would be a safe statement, even if not fully true. "The gold used in the swaps came mainly from investors’ deposit accounts at the European commercial banks. Some investors prefer to deposit their gold in so-called “allocated accounts”, which restrict the custodian banks’ ability to use the gold in their market operations by assigning them specific bullion bars. But other investors prefer cheaper “unallocated accounts”, which give banks access to their bullion for their day-to-day operations." "Investors have bought physical gold in record amounts during the past two years and deposited it in commercial banks. European financial institutions are awash with bullion and some are trying to pledge gold as a guarantee." But wait. Didn't the BIS "initiate" these swaps? Yet the commercial banks are "trying to pledge gold as a guarantee"? Who were they "trying" to pledge it to? Did the BIS intervene in something else that was happening by "initiating" these swaps? Think about this. "Unallocated accounts" at NAMED European banks, HSBC, Société Générale and BNP Paribas. If you are one of those investors that "prefer cheaper unallocated accounts" and you bank at one of these banks, they might as well have published a list of names with your name on it! Perhaps such a truthful article would have also said something like "HSBC was trying to pledge your gold to Goldman Sachs but the BIS intervened." This seems to me like a dangerous announcement to include in a carefully planned press release if you were afraid of a bank run. Doesn't it? I'm just saying it seems like a strangely SPECIFIC inclusion in an otherwise general, nonspecific and somewhat evasive press release. A few other interesting topics were also mentioned in this article. "liquidity crisis" "cross-border collateral" "counterparty risk" and more! 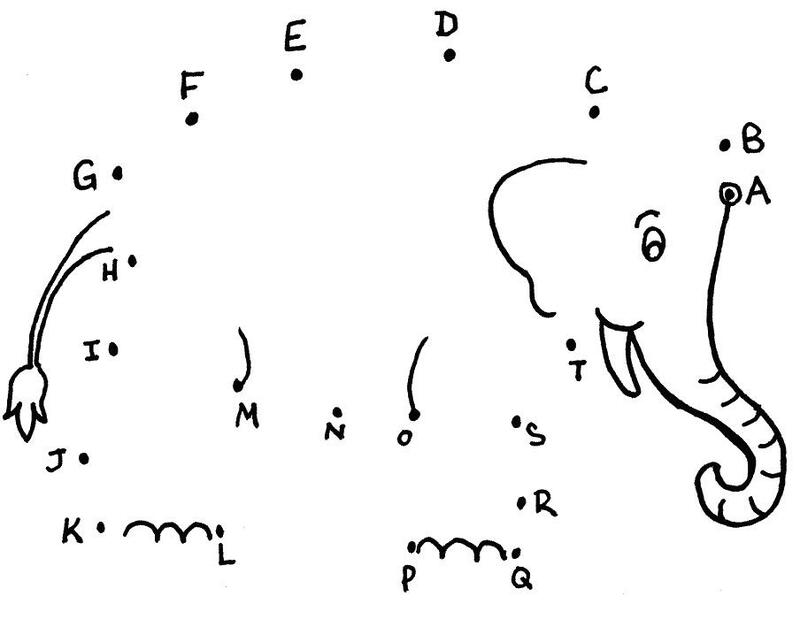 From a language use perspective this is a very interesting article to pick apart. One wonders how carefully it was written. It certainly wasn't written fast. Suppose gold explodes upward in price over a 24 to 72 period, starting in Asia on a Monday morning and rippling through world markets - what are the immediate side-effects for demand deposits, CDs, money markets, Treasuries, and other USD paper "wealth" accounts/instruments? What about actual physical FRNs? Is it your position that these "assets" will be completely "wiped out"? What response do you anticipate from the Fed, the USGovt, major commercial and investment banks? Sorry, I know that is quite a few questions, but I am very curious! Maybe someone else can answer based on their understanding of previous posts as well. Also, who has seen the 1981 film "Rollover"? In the final scene, the dollar collapses and gold explodes in price (sorry, spoiler! lol). I don't know how close to the mark it is, but I'm sure some people here would at least find it interesting. The bid/ask spread on physical coins and bars will quickly go so wide that no physical gold will change hands for a while. Meanwhile the ask on paper gold will go into freefall looking for bids, with a few "idiot" bumps on the way down. All the places you look to find the price of gold, like CNBC and Kitco, will only show the freefall. Yet Kitco will have no physical for sale at that price. They may take your money but warn of a delivery delay... that will last until you ask for your money back. Physical gold will go into hiding. Meanwhile, the chaos in the paper gold markets will have to be resolved with cash settlements... at the only known price, the one in freefall on the CNBC crawler. Gideon Gono: "The stockbrokers were creating a money supply that wasn't there. I printed Z$1.5 quadrillion, but the [stock] exchange was operating with Z$100 sextillion. So I said, "Who is doing my job?" Unless there is more discipline and honor, the exchange will stay closed. I can't be bothered. I don't know when it'll open. It's a free market, a business which must be allowed to succeed or fail." "I don't want anyone to put unnecessary pressure on Obama and hold him to supernatural powers. He's coming into a situation that is untenable already." "There are certain things, policies with the benefit of hindsight, where we could've managed our affairs better. I don't want to leave you with an impression that Gono or Mugabe are direct descendants of St. John or St. Paul. We are human." "...economics is not an exact science..."
"It's got to be a good year. What keeps me bright and looking forward to every day is that it can't be any worse. And those who have studied the history of economies know that we are down, but that the only thing that can happen is we will move up. That is a certainty." "I have been in the trenches during every moment of survival for my country. Any central bank governor is of necessity. When things go bad, we governors are the fall guys. No other governor in the world has had to deal with the kind of inflation levels that I deal with, no other governor has to come up with the gymnastics and strategy for the survival of his country. But let me say that in my bank resides the cutting edge of the country. I'm privileged to be the leader of that team." Yes one. What will the cornered animal do to you and your freegold? Gold is private. Gold is liberty. Gold is all the things FOFOA says it is. Can't gov't take that all away? Sure. They have spent the last 10 years conditioning us to the fact THEY give rights, not anyone else. I can't stop reading but can't believe TBTP won't do something to make it not happen. Did A/FOA ever see such a monolithic global gov't force coming at gold? I don't think so. I mean SEC doesn't have to talk. We can shoot American citizens now w/o due process. I mean just because freegold SHOULD happen doesn't mean it will. I want to believe you guys but don't trust them. THEM is the economics folks and political folks wrapped into one. The Fed IS tyranny. You guys see liberty washing afresh over the USA when freegold happens? I see the opposite. The trend has been steadily the other way. Sorry to go on. I can't stop reading this blog. I want to but can't lol. This is my first comment -- thanks very much for your blog! I am ~50% caught up on your historical posts, so I apologize if you have addressed this question elsewhere. I note that in your posts and those of FOA and Another (that I've read), that there have been certain market signals over the years that seem to indicate the imminent snap of the rubber band is at hand. It appears that potential black swans, some of them major (e.g. real estate crash, TARP, QE1, Greece, SPX/GS manipulation, look -- squirrel!) have not triggered the snap. I am wondering if, politically speaking, the other 75% of the world just isn't ready for the global dollar exchange to go away just yet. Perhaps it does have continued usefulness and if so, how might other powers live with all of the problems of the $US, but still 'hedge their bets'? Is there a way to keep the $US illusion alive yet maintain an equitable exchange of goods/value between non-oil producing nations? I recalled that following the Crimean War, the bankrupt Russians tried to instigate a bidding war for their hard-to-defend Alaskan Territory between the US and the British. Connecting the dots in my small brain, it seems that land might still today be a big enough store of value to 'fix' the dollar's many problems. Might the US still have a credible chunk of collateral on hand? Can the poker game go on for another 5, 10, 50 years if this were included in the ante? Though it doesn’t seem likely to me that Alaska be sold to the Chinese (I wondered what a buy/lease-back deal might do to Obama’s popularity rating), lo and behold look what I read in today's WSJ! In a major push into the battered U.S. commercial real-estate market, China's $300 billion sovereign-wealth fund is in advanced talks with Harvard University's endowment to buy its stakes in half a dozen U.S.-focused real-estate funds for about $500 million, according to people familiar with the matter. CIC is looking to boost exposure to U.S. real estate in a way that avoids the political and public-relations backlash that often accompanies foreign investment in high-profile U.S. assets. In 2005, for example, such an outcry helped convince Cnooc Ltd., a large Chinese oil concern, to drop its bid for Unocal Corp. To limit such potential fallout, CIC has targeted investment funds rather than specific properties partly to avoid such a stigma. CIC also is timing its foray into the U.S. market to avoid the mistake of overpaying for U.S. real estate. Commercial property today is particularly appealing to foreign investors because values are around 20-year lows and more than $1 trillion of property debt is set to mature in the next five years. People familiar with the situation say that CIC's funds have been almost fully invested and that it has applied to Beijing for a capital injection. [A]ssuming CIC gets allocated a further $100 billion, he expects it to invest an additional $10 billion to $15 billion in property over the next 18 months. Real-estate funds are "a good bet when you need to make a big investment and yet still stay under the radar," he says. Could it be that even the ‘enemies’ of the dollar are actually helping to keep the game afloat in order to extract once-in-a-lifetime concessions from the US? Could it be that the turmoil associated with a transition to Freegold (or something else) would precipitate too much domestic angst, especially where political control is fragile (i.e. China)? And how might this all influence a personal gold acquisition strategy? The timeframe reported in this article is interesting when compared with the timing of the BIS gold swap. "In their analysis, UBS noted, 'A new trend in 2010 is the movement toward fully allocated physical gold. In H2 and 2011, we expect this type of gold exposure will deepen as new and existing investors diversify a portion of their gold reserves to purely allocated form." ".... diversify a portion of their gold reserves (?????) to purely allocated form." ".... diversify a portion of my food reserves to purely edible form." Perhaps others will heed the "wake up call" from the BIS and get physical. "Yes one. What will the cornered animal do to you and your freegold?" I believe I have a different frame of reference from yours in approaching these types of questions. I suspect that you see a coming NWO and perhaps an attempt to create a One World Currency, One World Bank and/or One World Government. My position is: that IS the system we have lived under since WWII with the $IMFS and military power as the foundations of the (Anglo-)American Empire. Consequently I see Euro Freegold as the heir apparent to the $IMFS and the next evolution after the decline of the most recent attempt at Empire. Do I fear that the US will resort to war to try to retain its Empire? Sure, but I hope that America's military machine loses its "blank cheque" in time and stops inflicting misery on other countries. Will they turn on their own citizens? Sadly, that is a distinct possibility IMHO. In relation to your concerns about government. I can see that a government may attempt to do something stupid in response to the transition to Freegold. However, as FOFOA pointed out in his response to jenn, under this new economic paradigm it doesn't matter whether the state or an individual holds the gold. It is all useful capital within that jurisdiction. If you are concerned about someone attempting to loot your gold, you should be IMHO. Should government be at the top of your list? In the US, after the transition, I would worry more about local cops who either haven't been paid in 6 months or find that their US$ pay wont buy them a single can of beer? If you see a religious dimension to these unfolding events I am the last person you should waste your alarms on. I view religion as a branch of philosophy and in that context I think it has much to offer. The "end of days" isn't persuasive to me except as a storyline for a morality play. Strewth mate, thats a lot of wisdom in just a few lines! @FOFOA, maybe the BIS worded their unofficial press release the way they did to actually see if it incites the panic for physical among the European banks "unallocated gold account" holders ? something like testing the waters ? "...something like testing the waters ?" Broadly agree, but more like setting the "cat among the pigeons", methinks. How do these plans suit to freegold? reversed, expose the system to risks and shocks that a reformed system could minimize. of course without their love. "That said, the current system has serious imperfections that feed and facilitate policies—of reserves accumulation and reserves creation—that are ultimately unsustainable and, until they are reversed ...."
When you hear the IMF "speak" imagine you are listening to the Anglo-American post WWII "World Bank". Whose book are they talking? The $IMFS? Same old mantra, the so-called "paradox of thrift". They argue that the savers should spend, and then borrow, to consume in order to "correct the imbalances" in the international financial system. How's that strategy working out for the Western countries' middle classes right about now? Euro Freegold = medium of exchange + store of value versus $IMFS = faith based currency + debt. How can there be any middle ground, any further compromise between these two systems? They are natural competitors, natural enemies. It is programmed into their "DNA". There are times when you are forced to choose sides, times when refusing to choose is in itself a choice. So freegold requires the bankers leverage to go to 1:1, i.e. the crash of banking as we know it. The article posits what the worth of gold is to the banker (at his leverage), and extends that price to individual holders outside the banking circle. Banking as we know it (for some time) must the seize to exist. I don't think banking as we know it necessarily ceases to exist. Elements of it would and should change radically. Transactional banking would probably continue, it works very well most of the time. Probably fractional reserve fiat lending would continue, albeit in a more sustainable, conservative way. Remember when you had to actually talk to your bank manager to get a loan, and actually have history with a bank, so they trusted you and vice versa. But the existing wealth management side of the industry would change drastically, shrink, disapear etc. Lots of financial advisors and fund managers "reskilling". This all assumes that the wheels don't completely fall off in the next few years. Which is a pretty big assumption I guess. A good collection of links to the recent articles on China's announcement about developing the gold market. Barter only sustains a smaller population base. If the wheels are not to come off, transactional banking has to remain, including electronic transfers. If gold is to rise, hidden banker leverage has to be lowered (removed), and gold banking segregated from transactional banking. At a gold-banking leverage of 1:1, or when gold achieves the recognition of wealth storage supreme, this works. I.e. 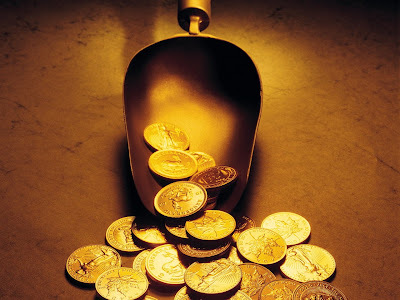 gold deposits, become recognized in the banking system. The Euro appears to do this. No such signs on the continent of the 'free'. I agree, transactional banking is boring but necessary. And gold separates itself from transactions, no longer needed to back the counters. Not sure what you mean by "no such signs on the continent of the free"? I would agree that the revaluation hasn't completed yet, but the ECB separation has happened no? But I think the story is moving East. I don't think you encourage your nationals to invest in physical if you plan to fractionalize it into paper. Quite the reverse. Everything points to China picking up the ball from Europe, and running f**king hard. You cannot look at China without geostrategy. Thereupon depends if their gold derivatives money play is $supportive or they take some steps towards dominance helping in destroying the dollar hegemony. We may have the Iran war upon us and that would be quite dangerous for China's oil.If I were China (Ha!) I would stop delivering rare earth metals, I would give Iran weapons and I would destroy the dollar (sell Treasuries irrespective how much I lose). If I could play the derivatives market to bring the Comex/LBMA to a swift default I would start quite quickly. China will be much more vulnerable if Iran fails. Same for Russia. Unfortunately the BRIC are to divided. The US world dominance has to come to an end to make the stage for freegold. China has to fight for freegold and I hope they have enough by now. Just a 'slight' at the sheeple brains of the usOFa. Wonder if they will wake before the slaughter? I don't really think China/India and the mass population cultures have what it takes to carry the ball. They seem to have problems of their own. Besides, TPTB aren't just going to not use 10 carrier groups, if that is what they perceive is needed to remain in the catbirdseat. So do you perceive China, restructuring their industry, and turning it inwards to build their own prosperity, based on their capture of the manufacturing assets? If I were China (and how do you know I'm not) I would generally be happy with my position, but I would make like a duck. All calm serenity on the surface, no sudden moves to upset the fragile status quo. Yes Yes USA I'll revalue the yuan because this excellent global financial system you've designed is super brilliant and just needs slight tweaky around the edges to carry us all to unending prosperity. The bottom line is no one knows what comes next. It's like a Mexican standoff. No sudden moves by anyone. Blink blink. Come now; the US is going to be building the goods for China and China is going to be the 'new' consumer. Talk about role reversal! The last thing to fear is the police; the citizenry is far better armed and substantially outnumbers the local constabulary... at least in my neck of the woods. Federal might be another concern, however. Actually on the subject of Mexican standoffs, anyone following the chatter about the astrological Cardinal Cross happening now? It requires a reset. A Jubilee. Many other names will also do. The reset is disruptive. LBMA doesn't ship gold. that requires a Brinks truck (or equivalent). All destinations are known. It is the refusal to ship that will bring it down. Not sure who is buying US Treasuries these days. Beware the Mexican stand off. Some guns are loaded, others are not. They were all loaded in Reservoir Dogs. Mind you, the UK's gun's not loaded. Their pants are loaded. A/FOA were adamant that China supports the Euro Freegold project. They said China would "go" with Europe and re-form a centuries old trading bloc (bringing much of Asia and Africa with them in caravan, perhaps?). In the early 80s China produced around 60 to 80 m/t of gold per year. They could only mine high grade deposits because of the primitive technology at their disposal unlike other gold provinces which had exhausted their highest grade deposits decades or centuries ago. China redrafted their mining laws in 1986 and started importing technology and expertise to ramp up their mine supply of gold. Circa 1990 the heap leach mining technology revolutionised gold recovery from low grade deposits. Who is the No. 1 producer (and still growing) today? China. Another reported that during the 1990s the "Asians" gatecrashed the Oil-US$-Gold party and were buying in volume. A/FOA also reported that the BIS initiated the 97/98 Asian financial crisis to stop the SEA nations from pursuing gold and that they were stripped of a lot of gold. As Another observed about the BIS role in enforcing settlement in the gold inter-bank market, "ask Korea". FWIW I suspect that 1054 may be a typographical error by the Chinese. Perhaps it should have read 4501 m/t. If memory serves me, an abacus is used right to left. Forget what China says. Do any of their actions in the past 15 years contradict A/FOA's claims about their true intentions? Nary a one, that this simpleton can see. Thanks. I will be in the back row munching popcorn enjoying the movie. If you guys see events start to happen that you didn't expect I hope to have some answers for ya, if I am still around to post (mass disappearance of folks). Thanks, I hope you guys are right. I want to go on the record, if I haven't already, that I disagree with the freedom that freegold seems to provide away from TPTB. But again maybe the masses do get jobbed and those few, us, get a pass. Are gold holders the new elite. Nah. They ain't going away. What you see as freegold I see as birth of what the progressive movement has been all about for 100 years. Hope you boys are right. Thanks again cost and FOFOA, who is quite the freegold evangelist. I think I finally understand you. "What you see as freegold I see as birth of what the progressive movement has been all about for 100 years." IMO the Euro Freegold architects were not attempting to do any of us shrimps, or society at large, any favours through the Euro Freegold project (except by perhaps averting WWIII). Remember what A/FOA said in the archives. The Euro Freegold sponsors learnt from the mistakes made by the US ie. people will happily transact with unbacked fiat currency and you don't need to control the price of gold in order to make this happen. In other words, gold can be allowed to fulfil its historic role without threatening a modified fiat currency regime and fractional reserve banking. FWIW I see Euro Freegold as an attempt to replace the $IMFS with a modified version of the fiat money system while allowing the EMU old money Giants and their allies to take control of the system. IMHO instead of the London-Wall Street "gang" stealing everything as fast as they can we will have the Euro Freegold bankers siphoning profits slowly and less perceptibly. IMHO this is as much about retaining a fiat currency and fractional reserve banking regime as it is about the necessity to replace the failing $IMFS with something else. There is no technical barrier to basing a new system just on digital gold. Great for the people, so why did they decide not to do that? Perhaps because it doesn't offer the bankers and politicians anything. Also, after the transition, the Giants will be able to deploy their gold and hoover up assets for peanuts. No matter how much gold we shrimps accumulate we will never be able to outbid them for any asset they want. No altruism here either (and no threat to their plans from us). On a positive note the currency-issuing politicians and bankers will be "under adult supervision" again with gold as the incorruptible regulator. This may prove to be genuine progress for humanity. I hope so. I think A/FOA acted out of altruism and FOFOA is motivated by the same impulse. The Giants? Maybe, but I seriously doubt it. As long as the government holds the monopoly to violence they still remain in control. Gold is not the only thing around, is it? I tend to agree with your explanation of the BIS gold swaps. It fits their profile making a relatively quite move like this to influence the market. I think this is rather big news. "Trying to start a business now is suicide because the bankers and politicians have virtually given themselves all the right to rip us off in broad daylight and I do not want to use my gold in such a uncertain world stage." Yup. We are all John Galt now, whether we know it or not. comex liquidations continue. up day for gold yesterday by like $8 saw another 6000 contracts leave now at 511k. "We are all John Galt now, whether we know it or not." LOL. How true. I had not looked at it that way, but now that I do, I believe you are quite correct. Just like Galt, for some time now I have been working to enlighten those around me, and encourage them to extract themselves from the system, both for their own benefit, and to hasten its demise. There are currently a lot of John Galts out there. Galt thought he was the logical conclusion but he couldn't reason he was a product of sacrifice by those before him.... fools never learn. Another piece about China and gold. "The PBoC comments should not be taken as a sign the official sector will buy gold, but rather that current restrictions on gold imports and gold investment products, such as exchange-traded funds, will gradually ease," HSBC said in a report. "Currently, households in China are the second-largest gold consumers in the world. Demand for gold in China nearly matches the private consumption in the United States, Middle East, and Western Europe combined." Presumably India still holds first place. "Data from Natixis reports showed that on the first half of 2010, trading volumes of gold in the Shanghai Gold Exchange rose by 49%. On the other hand, silver trading got a bigger boost, increasing five-fold." No mention of silver in China's recent announcement about supporting the development of the PM market. I wonder why. If China created an "official market" for silver how would they manipulate the price? Through the gold:silver ratio perhaps? If, say, they wanted to make Shanghai the No. 1 silver market then busting the Comex silver market would make a lot of sense IMHO. Where is the epicentre for the electronics manufacturing industry these days? China, Taiwan, Japan and Singapore would probably account for the lions share I'd imagine. Sourcing your silver from Shanghai would make sense given that China is the No. 1 refiner of silver. How would you move the bullion from New York? Do we finally have an explanation for HSBC's decision to boot the retail clients out of their New York vault? HSBC is an official Comex custodian after all. Lots of silver to ship to Shanghai while directing people's attention to gold, perhaps? Could the earlier Chinese statements about withdrawing from certain derivative positions be relevant? This article refers: the legal system can and does only enforce legal tender settlements. The entire article is a fallacy without legal interpretation. Simply put, if a person sells an asset/commodity many times over that does not exist, then it does not increase its value because people paid for something that does not exist. In fact the value drops because humans being emotional animals run from the investment and refuse to buy where there is corruption or misleading activity. The people who paid for something that does not exist simply lost their money - fools they are, and the value of the asset normally declines. If this were not so then thiefs world wide would make money from on-selling what does not belong to them. Simple law. Harvey Organ does pose the right questions: Why is the silver Open interest rising and the gold open interest falling? Why has no gold entered any of the registered vaults at the comex? I have not followed the COMEX and its OI long enough to answer them. Perhaps this is indeed the start of the COMEX' breakdown, perhaps it's just another paperbug game being played out. Someone is breaking this Comex.. Internal forces, external forces, who knows. watch the monday report for the OI, if it increases huge to match the spike in gold then the paper players are back in. Would you say the trillions us armchair, online "trading" muppets are probably now throwiing into the void (think accessable and transferrable online life savings?) is anything to do with the ongoing "success" of the fiat currencies (read $'s) ongoing but increasingly miserable life? Thanks for any thoughts FOFOA and co! OK, so I am being stupid. This needs to be cashed out and turned into gold coins? Right? But the Queen gave them an award! I totally understand your considerations. I also use BullionVault for approx. half my gold (other half is coins). BV proclaims that it's a 100% allocated vault and I see no reason to doubt them at the moment. All bars are physically delivered from LBMA and stored at separately in VIAMat vaults. BV certainly seem to "get it" regarding the difference between allocated gold (you owning gold) and paper gold (banks _owing_ you gold). My worries are mostly about the other aspects of using BV... In the case of freegold and the ensuing financial armageddon, how easy will it be to get your gold from BV (if you have enough to have reserved a bar in your name), or just how easy will it be to cash out with your local bank or lloyds tsb or SWIFT or whatever having a breakdown? And if you cash out you have traded out of your position, right? Well, then you could buy physical with your fiat digits, but what if physical trades at a big premium to BV gold (after freegold) simply because people trust tangible gold more and want to avoid the hassle of electronic transfers of fiat to get in physical possession of your nest eggs. I guess, right at the freegold transition / dollar collapse, worst case you just have to sit it out and wait to get your savings till things have calmed down and banking and the Internet works again. I wouldn't recommend using online gold-ownership services exclusively. Own some physical also. Let's assume that an investor in paper gold derivatives has no interest in holding physical gold. All the investor wants is to profit, in fiat currency, from trading based on changes in the currency price of gold. Under that scenario, if I understand what you are saying, your interpretation would be correct IMHO. If the price of gold in fiat currency or paper gold derivatives and the value of gold in fiat currency are NOT the same then your conclusion is false. This "investor" will want the thing with the greater value/price. Either paper or physical gold. Emotion doesn't enter into it. If fiat currency or paper gold derivatives are 100 times OVER priced then physical gold is UNDER valued by the same amount. A sensible investor will want physical gold rather than paper. If "price discovery" in a free market reveals this discrepency the holder of paper will be the loser and the holder of physical gold will be the winner. are betting that they will. The China is betting that they will. The Swiss CB is betting that they will. Those of us at the All Inn are betting that they will. If all of us are wrong: What do we stand to lose? The opportunity cost of an alternative investment's returns. If the holders of paper gold are wrong: What do they stand to lose? 99% of the revaluation of gold in currency terms. There's a discussion of Pascal's Wager and "decision theory" at this link. Whats the big deal with holding Pms in your hand? Run the statistical probability of a home invasion vs. bullion vault giving you your stash in the event of a reavaluation. John Williams, of Shadowstats fame, seems to think that a barter system will be an interim stage in the transition for the USA. If so, some physical silver may be a useful thing to have along with gold. In this interview he also reminds us that there is a hyper-inflationary trigger outside the US as well that could move independently of domestic policy. When things go out of hand and as they normally do, and one day you get up to see that the world you live in has turned upside down, what will be your chances of retrieving your PM from the bank vault ? what if there is no electricity ? no employees reporting ? thugs and thieves waiting out of the bullion bank to hack and steal the wealth of people who just come out with their PM ? What if by government decree a moratorium is placed on all bank transactions ? what if they call for a extended bank holiday ? My take, in the case of a world changing fiat breaking event (for which most of us have brought gold for as we know this will happen) the chances of an orderly delivery of gold from your banks vault to your vault weather allocated or unallocated will be a stressful job to accomplish with odds favoring a default or at-least a delay. What will a hyperinflation in the USA mean for us Gold and Silver 'All IN' crew here in Australia? I am 90% BV now, but will be 50 50 after next paycheck all being well. BV only as safe as the Internet at the end of the day, so it's got to get bad for that to fully crash. I am loving BV on the iPad almost as much as coinage haha so the trades will go on there for sure too, maybe more for silver from here on in though as that's not as easy to store at home in the kilos.....especially if there is some murky business going on currently keeping my kilos from going to the moon!! Thanks for your responses there team AU! everyone reduced their positions. I have never ever seen that happen before. Generally when you see that happen, you cannot get a more bullish sign to enter "all in" in gold. So while having never(!) seen something happen, he does know that this very something "generally is a bullish signal". That leaves one to wonder what this "historic rule" (generally) was based on. However, perhaps he will turn out to have been correct in smelling that something is going on at the COMEX. We can only ask for time to prove him so. That is why I hold a relatively small amount of silver coins. Should we go to barter, society will be in dire straits, and trust will be hard to find. In such an environment you do not want to cash in a kilo of gold, as it will most likely attract attention from some unwelcome "dark forces". Should it get that far, I hope the silver will allow me to maintain a relatively low profile, hiding what's in my belly when the angry lions fight over a small scrap of food. That sound you hear in the background is the Yankee gubermint's printing presses running "balls to the wall". One ounce in hand is better than 2 ounces under some other entity's control. you are right on Harvey, as much as he is baffled by the comex numbers, he knows that in all reality it is bullish as people are losing confidence in the paper games and trying to get the real thing. ted butler talks about this sort of also on his kwn interview today. as investors go after the real flow there isn't much you can do with the paper in terms of fictionalizing it. See below a couple of snips from article at "American Thinker". Nothing can save our financial system in the long run. It is doomed to collapse. This is inevitable, because our government controls and manages its very foundation -- the dollar. To put it bluntly, our federal government is flat-out bankrupt. Currency disintegration is always the unavoidable result of government bankruptcy. The dollar -- which has been weakening for many decades -- will at some point go into a sudden death spin. The only question is when. It may happen six months from now or six years from now. The timeframe is impossible to predict, but we can now be certain that happen it will. No one -- not even the federal government -- can escape the numbers. And the numbers are hideous. One hundred trillion-plus is a killer. 7. AUS$1.2 trillion in unleveraged superannuation funds. I'm not joking about No. 8. IMHO we have so much slack here if we got serious about conserving resources and making the most of our natural gifts we could be 10x more productive than we are. Folks who are already working flat out to survive don't have as much latitude as we have. The pleasure is all mine, FOFOA. I am beginning to move into "the slow lane" as I age. I am going to run fewer red lights, seek fewer high risk investment returns, etc. My gold (etc.) will be GIVEN away. I hope that fofoa fans will join me (and like minded ZeroHedge fans) and countless others in going to the ATMs this Thurs. (Aug 12th) and pulling $500 (or equivalent to our non-USA friends) as a SIGNAL to .gov and banksters that there are some of us who will ACT against their malfeasance who are destroying America. I hope to see many of you in line at the ATMs! Get there early, the lines might be long! Best of luck everyone in these 'unusually uncertain' times. Buy gold, silver, platinum. But, remember that while "Gold is King", that God is God, our Creator who rules us all. Live a good life that makes our world a better place. any idea how many you expect to do this? is there a site to follow this on or forum? Despite my reservations, we are going to pull $500 on the 12th out of respect for you. Hope you get a big response. Via GATA. Patrick Heller of Liberty Coin Service compares recent gold and silver price action to commodities that are roaring ahead. With major trading partners of the US government, who almost certainly helped perpetrate the manipulations, now closing out their COMEX gold and silver short positions at a record pace, that indicates that those companies expect much higher prices soon. My name is Tony Berlein and I am from South Africa. My son recently won a scholarship to Arkansas State University. He achieved this against all odds and obviously I am very proud of him. I am currently very pressed financially and appeal to anyone out there for sponsorship help. The reason I am posting on this site is that I am also trying to get a small gold dump reprocessing operation going in South Africa and follow gold posts on the net closely. I don't think that there is any doubt that the gold price will go up further. Paper currency is becoming more and more distrusted. The Chinese and Indians know this and that is why they are buying gold - to give there currency credibility. I believe that at some point in the not too distant future, the US will do the same. That is when gold will find it's true value as a store of wealth. $5000 - $10 000/ounce is not impossible. I would say that the best investment now is gold coin. Paper and stocks can be manipulated and mens actions in times of crisis are unpredictable. This report maps out proposals for a new international monetary order and looks at ways in which monetary authorities and political leaders can help prepare the ground for a new system and facilitate the transition. * Strengthen the role and legitimacy of international institutions, including how the surveillance role of the International Monetary Fund (IMF) can be reinforced to address more effectively the problem of exchange rates and payments disequilibrium. * Consideration of how the shape of the international monetary system in the 21st century will be significantly influenced by the interests and the requirements of the emerging powers, including how the dollar-based monetary system is no longer adequate for a larger and more integrated world economy. Mike, I have no idea how many people will do it. But, you asked the question, you should join in the fun, and pull out $500! I am promoting this idea every chance I get at ZeroHedge.com. costata, obviously this is a hard thing to do for many people. Do it anyway, you can always put it back into the bank the next day. Or buy some gold with it! I post with complete confidence that I am missing an obvious point. My other half would be quick to point out this wouldn't be the first time. In my post on August 3, 2010 9:24 AM I put forth an idea that fiat currencies seeking gold from idiot paper gold speculators may not play a role in revaluation. That is to say, when allocated account defaults begin in earnest, paper speculators will be happy to take their cash and go home -- because they never understood gold as money in the first place. It goes without saying that my premise requires many many helmet heads! But things being what they are, is it not safe to hedge our thinking that we might indeed be overwhelmed with helmet heads? In your response FOFOA, a very insightful one I might add, there was one sentence that caught my attention -- and this was it! In this case, Davey, Phil, James, and Johnny are receiving their initial US$ investment back, and if all four are speculating helmet heads completely unaware of the significance of gold, might they not place their returns into solar panels and water filters? I believe it is reasonable to expect that at least one investor in unallocated bullion is a helmet head -- happy to receive his initial investment in fiat currency unaware of the power of the printing press. But how would this effect revaluation if 2 helmet heads had no interest in taking possession of gold -- unaware of history? What if there are 100 helmet heads with gold in the LBMA? 1000? 10,000? We cannot know how many idiots there are -- idiots that will still be idiots after the revaluation -- but does this idea not plug a potentially very large variable into your equation? Total amount of currency riding in gold (on average - at all times) on the price discovery markets [minus currency from paper helmet heads that never want/wanted gold before/after revaluation] divided by the "window dressing" gold stocks that are actually available for delivery demands against that currency, times the published "trading price of gold"? Whoops! I received an error stating my first post was too long (indeed) so I reposted in two parts. Apparently I should have ignored the error propaganda. I realise your questions were directed at FOFOA. Pardon me for cutting in. This is a modified version of a reply I left for "Blobber" earlier. It may clarify a few issues that you raised. "Let's assume that an investor in paper gold derivatives has no interest in holding physical gold. All the investor wants is to profit, in fiat currency, from trading based on changes in the currency price of gold." These are the folks you describe as "helmet heads" are they not? If the price of gold in fiat currency or paper gold derivatives and the value of gold in fiat currency are NOT the same then this "investor" will want the thing with the greater value/price. Either paper or physical gold. If paper gold is collapsing in price and physical gold is soaring to new heights do you really think they will be "happy to receive his initial investment in fiat currency"? According to A/FOA, at some point, the BIS will force price discovery. The holders of paper are betting that they wont (without realising it). According to A/FOA the ECB/Eurosystem Central Banks are betting that they will. China is betting that they will. The Swiss CB is betting that they will. First, good job Robert on the physical donation. Hat tip to you, and I will partake in the $500 withdawl on 12th (GMT +10) for what it's worth. Now.. on to the main purpose of the post. I have been thinking about the thing around my finger - my wedding band. My observation is simple, I think. There are too many people who would benefit from a $50K per ounce gold price, because this would give them very roughly around $20K in an average in wedding ring gold (assuming about half an ounce, 18K) -- ie about a free cars worth! How can this be that so many people could benefit? It does mean them selling their rings and many wouldn't, but some would. Any thoughts on this? As an addendum, I have seen recently in Sydney (Australia) shopping malls the "Cash for gold" vendors. This is consistent (in my mind) with a higher gold price as the average person here is being encouraged to lose their gold. Gold is not (yet) in a bubble if it is being sold, not bought, by the average person. I do wonder where it all goes .. eventually. "There are too many people who would benefit from a $50K per ounce gold price ..."
its called a wealth transfer for a reason. i remember richard daughty talking about one time a worker at a hotel in Berlin was given a gold coin as a tip. during the hyperinflation in Germany he then became the owner of that hotel. like fofoa says, freegold works when gold is spread not when its hoarded. the giants will have more then enough gold to keep them as giants, but new rich people will occur and today's rich people will become middle class. similar to a game of monopoly lol. most jewelery has already been robbed here in North America for trade to cash since gold is at extremely high prices lol. but as a commodity price they are probably right. FOFOA and the great commenters here, I have to thank you for your gift of clarity on how physical gold may have have two vastly different prices at the same time. I never quite understood Another's suggestion and now it is crystal clear. The mechanism by which claims will become bids is also clear. What a brilliant trade by the BIS and the shadowy characters behind the BIS (European banksters, I presume). Short huge amounts of paper, long huge amounts of physical, force majeure, then they can buy up productive assets for a fraction of what they used to cost in gold terms. Looking at the history books, characters like the Rothschilds have adroitly moved back and forth between specie and government bonds - the transition to come just looks like another chapter in this book to me. I am still confused by the seemingly large amounts of physical bars and coins available at the current price ... one would think that a savvy Russian billionaire would send his agents around the world to hoover up as much of the stuff as possible at spot+3%. Or even a discount to spot, if some of the bullion selling mandates that I've seen on B2B commodity sites are accurate. Oh well, I may never understand, and will continue to be a simpleton, exchanging my fiat for bullion whenever I get some. I am not sure who started the Idea of withdrawing $500.00 from the ATM...But would like to know. I first ran across it at ZeroHedge. I have also been promoting on the cnbc boards, and 25% of current traffic has come from yahoo finance. The following is what I have posted. ***PLEASE forward this to family and friends. "Oh well, I may never understand, and will continue to be a simpleton, exchanging my fiat for bullion whenever I get some." Yes, a simpleton you are as is myself. My greatest wish is that the producers that have worked hard their entire life, conserved their excess production and saved this excess in fiat dollars were such simpletons as yourself. It hurts to think that these producers/savers, mostly family oriented folks will lose much of their savings when the Yankee dollar is revalued on a gold basis. Please continue as a simpleton and help your family and worthy friends to become such as you are. Hurray for getting the momentum going! Various people have written that they will participate in pulling the $500 (or equivalent local currency). as 99.9% of the population is drowning in debt. I think that this short piece from Jesse is a really good explanation of the underlying motive for the gold silver manipulation. IMO a link to save for the newbies wanting the basics. FOFOA, perhaps you wish to use this song (Pay Me In Gold) as your blog theme song for FreeGold. Maybe more good gentlemen such as Robert, that are financially able will support your efforts with the real thing. "Why do you think that's a problem?" Well, good question, and perhaps it isn't. It seems intuative to me that we can't all become rich at once. Not that $20K each is rich, but still. Yes, I agree that $20K is nothing compared to most peoples debt load. Perhaps that is the key. I stay away from debt, so I would get it as a bonus. Most people would be a minor clawback on interest. Thanks for your responses, all. Just read this article, and wanted to get some feedback about possible gold confiscation after the US dollar is toast. "One of the situations we believe is possible in the monetary world is very extreme. Let's imagine that oil producers decide to accept all 'hard' [main global] currencies and likewise China does so for its export goods. Let's imagine too that the Yuan invades the currency markets of the world. What will lie ahead for the U.S. Dollar? With the quantitative easing that is needed currently, it is possible that the Dollar will lose a significant portion of its global use and will tumble on foreign exchanges. The currency turmoil ensuing would encourage other nations to ask for more than simply the Dollar in payment. Its gold reserves would have to come into play, even as backing to a Dollar/foreign currency swap. By that time, the gold price would be considerably higher than at present, possibly even multiples of present prices. Would gold be liquid enough to satisfy foreign obligations then?..." cont. ... "Thanks to the excellent work of the Gold Council in London we can see in measured terms just how liquid it is. At the moment, before the scene we drew exists, gold liquidity is third after U.S. Treasuries and Japanese bonds. Gold is 2 to 6 times more liquid than U.K. Gilts and twice as liquid as U.S. Federal Agency Securities. This measure is against the gold traded on the London gold market alone, recently. If we were to add the rest of the gold traded worldwide its liquidity would jump still more, today. Now factor in the above scene. Japan is heavily dependent on the U.S. for its own financial stability, so the liquidity of its bonds would follow that of the States. Gold would then undoubtedly be the most liquid reserve asset out there. We believe this scene is possible, not yet probable, but possible. That would certainly move gold confiscation onto the agenda of the U.S. economy if it had not already happened. Combine the Phillips article with the article titledNIA Releases 'Japan: America's Lost Decade'. I hate to be the bearer of bad news but friends, we got problems! Phillips argues that we will face gold confiscation when a new currency is created to replace the US Dollar as the world's reserve currency and it will be backed, partially, by gold. He is probably correct. When FDR confiscated gold in 1933 the US was on the gold standard and in order to increase the money supply, the government needed more gold to allow them to create more dollars to fight the Depression. Since 1971 when we left the gold standard, there was no particular benefit for governments to own gold since gold was not needed to back a currency. But everything changes if a new currency is issued that IS GOLD BACKED." If gold is confiscated, how will it effect FREEGOLD? In those days it was best if the governments owns the gold. In these days, it is best if the public owns the gold. Gold backed currency is a thing of the past. File it away with every other ancient idea that has been superseded. We tend to move forwards, rather than backwards. Confiscation of gold ain't gonna happen either, for the same reasons. Horses for courses. They were both vehicles for different time. "Confiscation Anatomy - A Different View"
"I am still confused by the seemingly large amounts of physical bars and coins available at the current price ... one would think that a savvy Russian billionaire would send his agents around the world to hoover up as much of the stuff as possible at spot+3%. Or even a discount to spot, if some of the bullion selling mandates that I've seen on B2B commodity sites are accurate." Those "mandates", buy or sell, are all scams, I've never seen one come through. The reason physical is still available and is not being hoovered up is because the majority still trust the systems, gold buying is still a fringe activity. We are a fair way off a crack-up boom, excepting a black swan event. I'm a long time reader of FOFOA's blog and believe the outcomes detailed in the blog are a real and viable outcome. I also believe contrary positions are worth reviewing in an effort to prevent groupthink. The video below was recorded in 1985. It outlines a process by which nations are destroyed... a process people were painstakingly trained to execute. This man's career was in that field. The interesting thing is just how closely the process matches what has occurred within the US. The interesting thing about this video is that it suggests a very different outcome than I think many of us envision... one in which liberties are so crushed under dictatorship that old frame of references no longer apply. In such an outcome, gold might not be redeemable. It would have value of course, but not value we could extract. I think people here will find the video worthy of the 8 minute run time. Be sure to fast forward to the 22 second mark, as the initial music is hideous. Is There A Liquidity Problem At Goldman Prime? Ishkabibble, thanks for posting the video link. I'm curios to see what the FOFOA hivemind thinks about it. Ishkabibble, I've wondered about what is the best situation for TPTB in terms of how much economic power the average person should have. I have come to the conclusion that TPTB maximize their wealth and power when the average person is not living in poverty. Throwing people into concentration camps so that they are not productive members of society does no one any good, this is actually a drain on the overall wealth of society which can be siphoned off by TPTB. In their best interest, they want to keep everyone satisfied enough that people can achieve some degree of success in their lives, but not so much that the majority of the population can retire early on a working man's wage. They want everyone to be enslaved to The Man for their whole lives, and to be productive members of the workforce. If you compare TPTB to parasites in the natural world, a parasite does not want to kill or severely cripple its host, because then the parasite would no longer have a place to live or food to eat! Rather, parasites want their hosts to be as healthy and productive as possible, so that the maximum amount of resources can be siphoned off. This is why I do not envision TPTB orchestrating a complete collapse of the economy and throwing everyone into concentration camps, as many conspiracy theorists maintain. There is no benefit for TPTB in doing this. We will lose our currencies of course, which has always been the inevitable outcome while on a fiat currency, but then things will be reset and economies will continue. The economic problems that the US is going through now are perfectly explained by its fiat monetary system which requires perpetual economic growth to function, in the face of an actually shrinking economy as the US manufaturing industry packed up and left for China, and a US population under the illusion that they can maintain their previous standards of living simply by spending more and more worthless money on junk food and building more houses, in a misguided belief that they are "stimulating" the economy. The only way this illusion can be maintained is by going into deeper and deeper debt, and any sane politician would of course support this illusion or not be elected. This debt accumulation is what has been happening over the last 20 years or more, and now the mathematical rubber band is about to snap. Of course, there is always the possibility that another Hitler type individual could gain prominence in such an environment and really wreck havoc. Hey FOFOA, any chance you could put a comments link at the top of each post you do as well? It does my eyes in scrolling down every time to find the comments bit when i come back to follow the thread!! I was on the train home tonight and I recognized a suit sat opposite me....it was the UBS teller who sold me the last vreneli I bought! He gave me a Hmmm I know you look and so I said to him "Are vrenelis selling well at the moment? He clicked who I was, and I swear looked over his shoulder before he nodded, smiled and said Yes, very well. Haha, roll on pay day and hang in there for a month or two more please mr.$!!!! P.S Marc_BC that post of yours above is bang on. Nail. Head. Hit. But lets hope it's a nice Hitler this time round eh? @Ishkabibble, most of those who claim that there are no differences between the 2 parties and that there is some kind of monolithic TPTB have long refused to recognize the magnitude of the evil that communism has represented over the last nearly 2 centuries. The clip you posted discusses how brainwashed these people have become. IMO, they are instantly recognizable by their refusal to even acknowledge that the battles of the cold war like Berlin, Hungary and Prague were caused by communists, and that perhaps Vietnam wasn't a war of US imperialism. These brainwashed people have nearly a monopoly on thought/consensus in all the major economic blogs like Mish's, ZH, Calculated Risk, etc. Normally I would never bring this up in a place like Fofoa's comment section, but here goes. IMO, when the USSR collapsed, the poison that they had injected into the west was already starting to bear fruit, and this poison is what is killing the west. Obama, the Clintons, and all the other "progressives" either knowingly or unknowingly have aided and abetted this process. These lefist americans had their communist idols, like Alinsky and now even Howard Zinn, who actively worked to bring down the US and its "capitalist" system. Well they have won, and they have destroyed not only our country, but also our culture and our freedoms, and if we are ever to regain them we will have to have another revolution as bloody as the one our founding fathers faced. On another note, this piece by Gary North is worth the read. I had never realized that the farmers of the late 19th and early 20th had been such big supporters of soft (fiat) money. 2) To destroy the dollar as the worlds reserve currency. "We all know that the Soviet Union collapsed in 1989. This was done by the BIS without firing a shot. They simply loaned large sums of money to the Soviets, and then called the loans. Just a routine castration! A simple foreclosure. This is how they got the Russian gold. "The second goal, of bringing down the dollar as a reserve currency, has not yet been reached, but I believe it soon will be." Understand that the essence of the BIS is to be a sort of professional organization (a union, if you will) of the national monetary authorities (central bankers, not politicians) of primarily European countries, not a unilateral, stand-alone entity. True, the US finally took its seat at the table in 1994(?) and the BIS has become much more international since. But if you were to give the above statement a hypothetical measure of credibility, could you fit it into your paradigm? And if so, could you find clear a path to adjust your line of thought that, "if we are ever to regain them we will have to have another revolution as bloody as the one our founding fathers faced."? I'm not really concerned about the absolute accuracy of the above quote. And certainly not of the entire piece. It is not "insider information." It is simply the view of an observer. But what does interest me is that the general thrust of the piece provides a unique reconciliation between your paradigm and A/FOA's. And in so doing, it perhaps offers a different conclusion. If the Communist powers in the East were adversely affected by a monetary collapse, what will happen to the ones in the West? But Desperado, you miss the point that most other western countries which are far more left leaning than the US have actually been doing quite well economically ..... could you please compare Sweden's and all of its neighbours' economic performance with the US's? And my god, they're ..... wait .... SOCIALISTS!!!! And Canada has SOCIALIZED medicine!!!!! (actually, so does every other modern country). How can those countries even function??! Destroy the US dollar as the global reserve currency? Sounds like a legitimate goal to me; it was an honour the US never deserved to begin with. It was US free market capitalists who went along with turning the US economy into a service-based one, surfing from one bubble to the next, under the guise of "healthy" free market competition with a country on the other side of the world which has no environmental standards and labour that costs $2 a day, and can do things for 10X cheaper because the filth the factories spew into the air there gives someone ELSE cancer, and they don't have to worry about it because there are no lawyers! Isn't the free market great? THAT's what destroyed your country, not some nefarious low-key communists extending their tendrils throughout every finger of your society. It's time the US grew up and took some responsibility for creating its OWN problems rather than always blaming someone else. Your economy is rotten because you don't do anything productive anymore. You all insist on living off junk food and then coming down with every imaginable disease as a result, and then wondering why your medical system is astronomically expensive because every third person is a pill popper just to stay alive while they metabolize their last McDick's Happy Meal. You as a nation go out of your way to shoot down and sabotage new innovations in technology that could make you world leaders and attract commerce and investment (the Chevy Volt electric car, and of course the EV-1 a decade before). Y'all insist on remaining addicted to one of the most inefficient, polluting and expensive sources of energy there is -- oil -- when much better alternatives exist (you could power a COMPLETE transition to electric cars simply by using the energy currently wasted in the oil refining process to turn tar sand and crude into gasoline). As a nation you REFUSE to take the steps needed to get off oil and therefore stop funding Saudi terrorists because 1) you are run and brainwashed by Big Oil, 2) you view any attempt to get your country off oil, and the tremendous taxpayer subsidies needed to keep oil flowing, as some left wing communist conspiracy to infiltrate and destroy your economy, and 3) gold is somehow involved with oil, and I admit that I don't understand this very well. FOFOA has elaborated on this. Nope, America is rotten because America made the decision itself to become rotten, and remain there. AND America makes terrible coffee. @Mark BC... You're view is one of the reasons I hate Globalization and the Peace corp.... We never needed anyone but yet are bankrupt and hated by the losers of humanity... Canad included. Hello Fofoa, thanks for the +1, although the link to inglorious basterds confuses me a bit even though I loved Lt. Raines character I find Tarantino's wanton violence very distasteful. I am as opposed to the EU as I am to the US federal government in washington, and that is why the crash of the Euro and then the EU would not be a bad thing in my mind as long as there was not such a great power vacuum created that Russia, Iran, Turkey, etc tried to pull a Napolean. IMO, the EU and the US Federal governments and large swaths of their institutions have long been infiltrated by communist moles. If the BIS had to take a side, it would side with the EU, but its members surely are as enamored with power as any other elite, and they would consistently work to minimize any threat to that power by other elites of the world. With the threat to their power by the USSR eliminated, the next biggest threat would have been the US and their major concern would have been the power of the reserve currency. This is entirely consistent with your quote in the post above. I don't think that the BIS has any mandate/responsibility from/to anyone but the members of their own elite club, so they are as sinister as any other cartel, if not far more so. The capitalist powers (this probably can be construed as being "the rich") are certainly put at risk by a monetary collapse, but since they are a far larger and more international group than the communist elite and have had the time to prepare for the collapse, so they will not be destroyed. Many if not most of the communist elites managed to "hoover up" most of the valuable assets during the collapse of the east, and so they came out ahead. Whether the western elites will be able to accomplish the same is certainly not clear at this point in time. Freegold also enters into this discussion because not only is it a tool that can be used to bring any wealth we may have into the post-collapse world but also because gold is one of the best tools we have to try to bring down this charade of a market economy and end the rule by the elites. If enough people move to gold, we can starve the system of our investment and our taxes and thereby speed up it's demise. Fofoa, my question to you is: Do you think that the BIS was corrupted by its Nazi connections and do you think that it is still unduly influenced by the Germanic/Continental banking system? I can't resist jumping in here. "..... do you think that it (BIS) is still unduly influenced by the Germanic/Continental banking system?" If you investigate the BIS you will find that of the 185+/- CB members only around 10 have the highest level of decision making powers. This inner circle is overwhelmingly dominated by representatives of European CBs. IMHO Another's answers to the questions below are equally true to this day. I would say, "Old World Order" to return. To understand/explain better ....."
**Who does BIS really represent? (Another)"old world, gold economy, as viewed thru modern eyes" or " way to move from US$ without war". We never needed anyone but yet are bankrupt and hated by the losers of humanity... Canad included. Of course you needed EVERYONE. Why should you otherwise have so many client states? And actually you are hated or disregarded by most of the Europeans, not only by "losers". Not the simple people, but your governments, your elite is mostly hated. Europeans have learned from their history and they hate wars and you support wars for democracy. Our puppets politicians corrupted to power go to war for you against our will. @Mark_BC: I currently live in Switzerland and have lived in the past in Germany for 3 years, so I know a little about socialism in Europe. Europe was the birthplace of socialism and communism and they have been conditioned (brainwashed) into accepting that this is the the best system for generations, starting with Bismark. Socialism was seen as one way for the aristocrats to maintain power over the proletariat while avoiding a communist revolution. Switzerland is far and away the least socialized country in Europe (and in most ways it is still far more socialist than the US), and there are ex-pats from all over europe who come here to escape the suffocating socialism in the rest of Europe. Switzerland has one of the finest healthcare systems in the world, and it is NOT SOCIALIZED. I have spent several miserable hours in a socialized-medicine emergency room in Spain, and I have many German friends who have nothing but disdain for their system. But really, I don't think Fofoa wants his comment section to be a forum for a healthcare debate, especially from America hating Canadians suffering from inferiority complexes. Canada still carries the image of "her royal majesty" on their currency and gold coins, so even after over 3 centuries you guys still haven't freed yourselves from the British aristocracy. As far as America's foibles go, she certainly has her share of them, and many of these are the reasons why I expatriated a few weeks ago. But America remains the birthplace of Jefferson and Madison, it remains Reagan's the city on the hill and is the birthplace of consitutionally "guaranteed" individual freedom. No other country around the world, least of all Canada, has Ron Paul's, Andrew Napolitano's, and the tea-party. And this is the thing that worries the most about Switzerland and Europe, that the citizenry has become so brainwashed that, not only couldn't the people exist without thier mother-state, but that they can't even recognize how socialism has stunted and suffocated their thinking. "its members surely are as enamored with power as any other elite, and they would consistently work to minimize any threat to that power by other elites of the world." This applies exactly to the US elites as well -- the US is not exceptional. "Europe was the birthplace of socialism and communism and they have been conditioned (brainwashed) into accepting that this is the the best system for generations, starting with Bismark. " In the same way that Americans have been taught that the US is a capitalist democracy (guffaw!) and that THAT is the best system, ever, anywhere? "America hating Canadians suffering from inferiority complexes. Canada still carries the image of "her royal majesty" on their currency and gold coins, so even after over 3 centuries you guys still haven't freed yourselves from the British aristocracy." Are these sorts of insults really necessary? I hope that living abroad will bring you into contact with people of different world views and cultures so you can examine your assumptions critically. Culture to humans is like water to fish; it is invisible while we're surrounded by it, but by stepping outside into another culture we can learn more about our own. @Fauvi..... America was independent. Was built on the ideas of Independence. Globalization has stolen our independence. We are left without culture or wealth. We don't need , we build. Firstly, you call me out for "insulting" the canadian Mark_BC, but ignore his far more multiple and egregious insults to Americans, which is already an indication that you are an American hater too. Then you say "the same way that Americans have been taught that the US is a capitalist democracy (guffaw!)" which is more evidence of your bias. Finally you spew forth this stream of Multi-Culti drivel: "bring you into contact with people of different world views and cultures so you can examine your assumptions critically. Culture to humans is like water to fish; it is invisible while we're surrounded by it, but by stepping outside into another culture we can learn more about our own.". This kind of crap is exactly what the brain-washed communists in Iskanbibles original clip believed. My beliefs are exactly the same as Martin Luther King's: "a nation where they will not be judged by the color of their skin but by the content of their character", which is far different from a school of thought which that dictates that all cultures are equal even if one of them wants to stone gays to death, perform terrorist acts on each other and genitally mutilate young helpless girls. Hi FOFOA, I'm new to your blog, but have spent a few hours digesting a couple of your posts and will certainly be back - you have a new fan! But I'm afraid I'm an inquisitive and possibly ignorant fan (having said that, I did buy as much bullion as I could afford about 2 years ago, so maybe I'm not as ignorant as I think). Anyway, my question (which will show my ignorance) is this: if holders of paper gold try to take delivery, they'll simply be given the cash equivalent, won't they? So they'll be happy. The problem will come when you get to the stage where the 'company'/bank/whatever can't afford to pay their dues. That will no doubt hit confidence in the company, and maybe have a little knock-on effect on the price of gold, but how will we see paper gold plummet while physical gold soars? I don't see any eventuality where the 2 will split. Even if 100 people 'own' each ounce of physical gold, those of us that actually have possession of the physical won't be able to demand any better price - or will we? And if so, how?